So I haven’t talked about e-reading here in a while, and it’s definitely overdue. This fall I received a Nook 3G as a gift, and it has completely changed my reading life. I read more, and in more situations, than I previously did, or could, and for longer periods. The convenience of a single flat surface rather than an open book makes it truly hands-free, it weighs significantly less than most hardcovers, and the ease with which I can have a book to hand when I think of a title is almost scary. This does NOT mean I’m going to convert entirely to e-books from here on out, nor will I get rid of any of my physical books just because I can get them on my Nook. I have chosen to check out e-book versions of some titles I own but hadn’t read yet simply because my books are still mostly in boxes and it doesn’t cost me anything to use the library, but bookbuying is one of my greatest pleasures, and browsing online doesn’t even remotely touch the feeling I get lingering in a brick and mortar store, particularly one with lots of awesomely musty volumes. 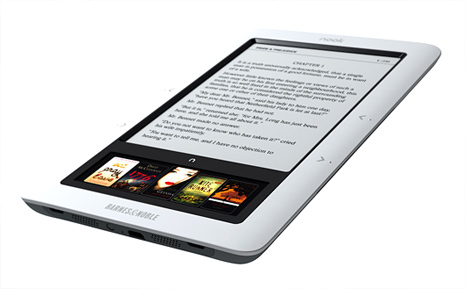 So, your turn – do you own an e-reader? What would you say, if any, is the difference it has made in your reading?